If you must take RMDs (required minimum distributions) and you're charitably minded, then you may be interested in taking a qualified charitable distribution (QCD) to satisfy your RMD. This approach could allow you to control your income and possibly lower income taxes, avoid taxation of Social Security retirement benefits, and skip surcharges on Medicare insurance premiums. The QCD is a distribution or withdrawal that avoids taxes associated with an otherwise taxable distribution from an IRA (but not an ongoing SEP or SIMPLE IRA). IRA account owners must be 70.5 years or older at the time of the QCD. The distribution must be paid directly to a qualified charity. These rules seem straightforward but there are some nuances of which you should be aware. The QCD can satisfy your RMD, which is an IRS-mandated withdrawal from your IRA (or IRAs if you have multiple accounts) beginning in the year you turn 70.5 (that's seventy years plus six months). Many types of retirement plans carry RMDs, such as 401(k)s, 403(b)s, 457(b)s, and profit-sharing plans (see also RMD Comparison Chart for various types of plans). However, a QCD may satisfy the RMD with an IRA only, not 401(k) accounts, etc. and not ongoing SIMPLE and SEP IRAs. To qualify as a qualified charitable distribution and satisfy the required minimum distribution, the QCD must be taken before other taxable distributions. I suggest the QCD for consideration if you're already giving to charity and must take a distribution from your IRA. RMDs are nothing to mess around with. The IRS penalty for failing to take an RMD is hefty. According to the IRS, “If an account owner fails to withdraw a RMD, fails to withdraw the full amount of the RMD, or fails to withdraw the RMD by the applicable deadline, the amount not withdrawn is taxed at 50%.” Yikes! You must be 70.5 or over to take a QCD. This rule differs slightly from the one for taking an RMD, which is the tax year in which you turn 70.5 years old. You could be required to take an RMD but not be eligible for a QCD during a period of several months. So, if you want to invoke a QCD in the year in which you begin your RMDs, make sure that you initiate the QCD after you turn 70.5 years old. In addition, you must be 70.5 years or older to take a QCD from an inherited IRA. Michael Kitces, CFP explains that only certain types of public charities are eligible to receive QCDs. In contrast, private foundations, donor-advised funds, and split-interest charitable trusts are ineligible. Further, these distributions must meet rules that would otherwise qualify a contribution for a tax deduction (even though the QCD itself can't be an itemized deduction). For example, if you purchase dinner tickets for a charity fund-raising event and receive a meal, then you can't deduct the full ticket cost on your taxes; that is, you can't use the QCD to contribute to an organization that offers a direct benefit to you. The distribution must be made directly to the charity to be considered a QCD. You can't take a withdrawal and then donate the proceeds to charity and claim that series of events as a QCD. In an article published by Wealth Management, tax consultant Michael J. Jones suggests contacting your charity to determine its exact payee name and instructing “your IRA trustee or custodian to make a transfer from the IRA directly to charity” using this name. In addition, he advises to get a letter acknowledging your donation from the charity. Your personal tax situation and desire to give charitably influence whether the QCD approach makes sense for you. 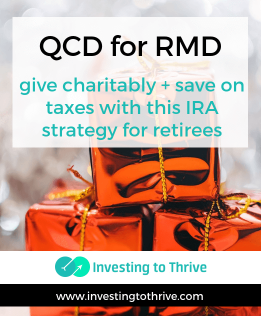 If you're set on making a charitable gift, using a QCD to satisfy all or part of your RMD avoids taxes that you'd otherwise pay on this distribution from your IRA. The QCD could help you keep your taxable income low enough to avoid taxes on Social Security benefits and high-income surcharges on Medicare premiums. If your combined income is greater than $25,000 as a single filer or $32,000 as married filing jointly, you'll pay taxes on Social Security benefits. If your modified adjusted gross income (MAGI) exceeds $85,000 as a single person or $170,000 as married filing jointly, you'll pay extra for Medicare benefits (Part B and prescription drug coverage). In addition, the lower income associated with the QCD may benefit you in other tax-related areas, such as tax credits, your threshold for claiming medical deductions, and long-term capital gains tax rates. So, even if you hadn't planned to give to a public charity, you might find a reason to initiate a QCD — if the overall tax savings is greater than the dollar amount of the gift. Alternatively, you could take the RMD and add the gift amount to itemized deductions. However, it's possible (and, statistically, likely) that the standard deduction will be higher than your itemized deductions, rendering the gift useless in terms of tax savings. Other tax-smart giving strategies include donating shares of stock or giving from a donor-advised fund. Depending on your state's tax law and your personal financial situation, these methods may be more beneficial than a QCD to your combined federal and state income tax bill. Still, a straightforward way to avoid paying taxes on the RMD is the QCD. Note that you'll receive a 1099-R showing a distribution but you'll need to note that it's a QCD and not taxable when you file income tax forms. Generally, the RMD from your IRA increases your taxable income. Depending on the size of the RMD and other income sources, your taxable income may rise to a level that triggers taxes on Social Security benefits, surcharges on Medicare premiums, higher capital-gains taxes, and more. If you take a QCD to satisfy the RMD, then your gift could benefit a charity and your personal cash flow.